Manila Metblogs » Craving for ome rice? Try Hang Kang! Craving for ome rice? Try Hang Kang! If you are craving for ome rice (also known as omelette rice and omu rice), try Hang Kang’s ome rice. I suppose that Filipinos who like eating omelettes or torta would say that this is probably weird because there’s fried rice in the omelette itself. It’s a Korean dish and it’s really yummy. You could even have some noodles in it. My sister says that it’s a tricky treat so that kids will end up eating vegetables though. Hehehe. 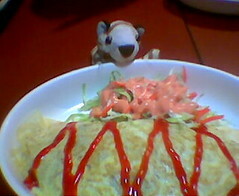 Haven’t tried omelette rice before. Sounds interesting.